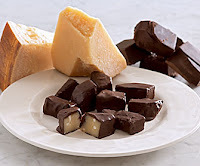 NapaStyle From one of the finest confectioners in Italy, it’s a bon-bon of Parmigiano-Reggiano and cream carefully dipped in rich, 60% cacao dark chocolate with white chocolate topping. The flavor is off-the-charts—one of the best taste combinations I’ve experienced in years. It’ll blow your mind—and your guests. Nine pieces per package. 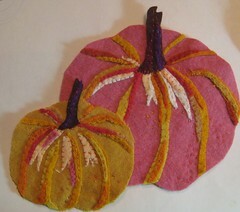 Two pumpkins. One more in the works. 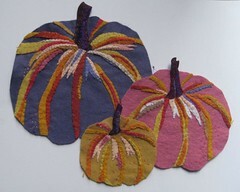 Hand-stitched from wool felt. 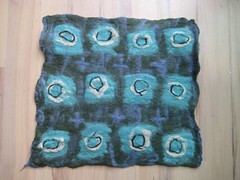 It's about 3" wide. 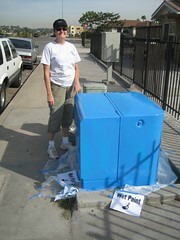 Remember two years ago, when I painted a couple of utility (electrical) boxes in Southeast San Diego? Well, I'm doing it again. 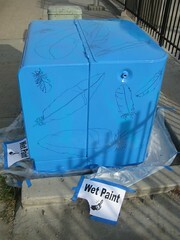 Husb helped me paint the first coat of two shades of blue, then I drew the feathers on with black marker. Next step is to paint the feathers. Sixteen different artists were selected, based on their entries, by the Southeast Developement Corporation to paint a bunch of utility boxes. Here's mine on 55th Ave and Imperial Ave. I'll go back on Monday to work some more on it. 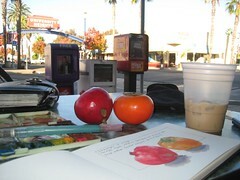 Yesterday, I spent a delightful two hours walking on Park Blvd, in University Heights, ending with a drawing and an iced coffee. Perfect. 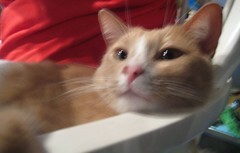 what can be sweeter than a kitty on your lap? 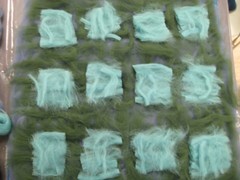 I took a four hour felting workshop at the Mingei Museum in Escondido on Saturday. 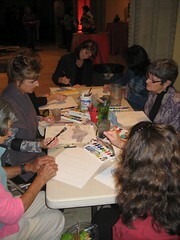 Jean Degenfelder taught the class, and it was great fun and easy too. I plan to do more of it. My work at the Oceanside Museum of Art Gift Shop! 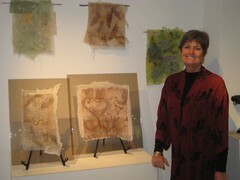 I'm thrilled to have my organza pieces in the Oceanside Museum of Art gift shop, especially during the run of the Quilt Visions exhibition. 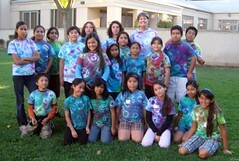 Here's the Thursday kids in their fabulous tie dye t-shirts that we made last week in Mundo Lindo the grant funded after-school program that I teach. 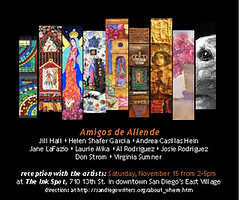 My friends and I are having an art reception at the Ink Spot in downtown San Diego, and you're invited. Directions here. Susan in Seattle! Susan has won the copy of Mixed Media Portraits. Susan, email me your mailing address. Of course, you have to promise to show us your self portrait too!!! 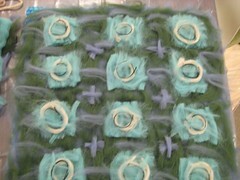 Over at Mundo Lindo, the kids have been creating tie dye t-shirts. Last Thursday, we had 21 kids in class and Tuesday we had 12. 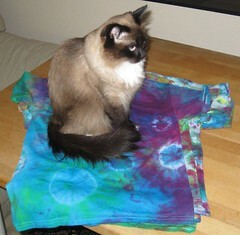 I had the job of rinsing out some of the shirts. Here's BeBop on a stack of shirts. They ALL turned out great!!! 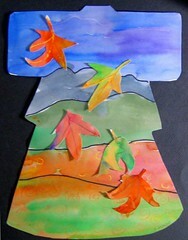 Here's the kimono artwork (watercolor, wax resist and collage). The lesson is geared towards 3-6th graders, but the plan has adaptations and suggestions for older kids. Email me if you'd like a copy of the lesson plan. disclaimer, this self portrait is not in the book. Cate Coulacos Prato (features editor of Quilting Arts and Cloth Paper Scissors magazines) has written a Mixed Media self-portraits inspiration and technques invited me to be a featured artist. I'm page 104-107.
thinking about the direction they'd like to take. Cate: Two things are very important. One is, get over the notion that people will think you're conceited if you do a self-portrait. Famous artists and children do them all the time; they're an exercise, not self-worship. The second is, get over the notion that a self-portrait has to be an exact representation of your physical self. If you want to do that, that's fine--it worked for Rembrandt. And in the book, several artists have addressed techniques for capturing a physical likeness. But all indications are that even Rembrandt wasn't just trying to capture his own physical image; he was interpreting, experimenting, recording, even playing. 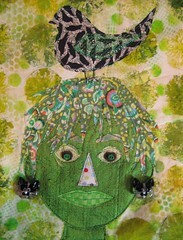 Making a mixed-media self-portrait frees you up to interpret the self any way you like. It not only teaches you something about art and form, it teaches you about what's inside you, what you'd like to tell the world about yourself. Me: I love Kelli Perkins suggestion, in the book, that she took photos around the house of her favorite things and created a quilt from that. What other things might my students do to spark a theme? Like journaling prompts? Cate: Wasn't that fun? Kelli did a great job with that (there's a quiz in the book to help readers do the same thing). Similar ideas would be: to look at your wardrobe and pick the most prominent color, then start playing with art materials in that color; dump out the contents of your purse or wallet or backpack and use it as a Rorschach test to discover clues about yourself; write down your three favorite quotes--or even your three favorite words--and tell a story about yourself based on your choices. You might keep a self-portrait journal and do one 5-minute exercise a day like these. Then, once you've accumulated some information, go from there. Cate: Yes, I did a self-portrait. The editors made me practice what I preach! It's in the book opposite the introduction. I altered a vintage turquoise portable typewriter with buttons and other embellishments and printed one of my favorite quotes from T.S. 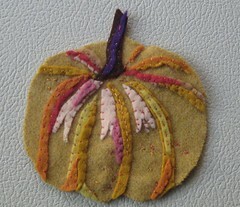 Eliot about writing onto vintage fabric which I threaded through the carriage. It says a lot about me: I love vintage, I am a writer, I grew up in the same era as that model typewriter (and, in fact, had one just like it), and I express myself through words. Being a communicator is not just what I do, it's who I am. So now, dear readers. Leave a comment, what do you imagine your self portrait to look like and on Wednesday, November 5, I'll do a random drawing and Cate Coulacos Prato will send you a free copy of Mixed Media Self-Portraits!